According to Hubert Staudigel (Scripps Institution of Oceanography) and Stanley Hart (Woods Hole Oceanographic Institute), Vailulu'u seamount, the most active Samoan submarine volcano, erupted between April 2001 and April 2005. It formed a 293-m-tall lava cone, which was named Nafanua after the Samoan Goddess of War. This new cone had been growing inside the 2-km-wide caldera of Vailulu'u at a minimum rate of about 20 cm/day since April 2001. Nafanua was discovered during a 2005 diving expedition with the National Oceanic and Atmospheric Agency (NOAA) research submersible Pisces V, launched from the University of Hawaii research vessel Kaimikai O Kanaloa (KOK). It is located in the originally 1,000-m-deep W crater of Vailulu'u (figures 5 to 8). Figure 5. The route of the 2005 cruise of the research vessel Kilo Moana. Vailulu'u, towards the E end of the Samoan hotspot trail was visited on cruise days 1-4, 4-8 April 2005. Courtesy of H. Staudigel and S. Hart. Figure 6. Bathymetry of Vailulu'u and nearby Ta'u Island, based on a SeaBeam bathymetric survey performed during R/V Melville's AVON 2 and 3 cruises, augmented with satellite-derived bathymetry from Smith and Sandwell (1996). The inset shows the general location of Vailulu'u with respect to the Samoan Archipelago; two other newly mapped and dredged seamounts (Malumalu and Muli, AVON 3 cruise) are shown as well. Scale: 10' = 18 km. From Hart and others (2000). Figure 7. Bathymetry of the Vailulu'u crater between the 1999 and 2005 surveys, showing the emergence of Nafanua. Courtesy of H. Staudigel and S. Hart. Figure 8. Bathymetric map of the Vailulu'u seamount from multibeam data during the April 2005 survey. Note the new inner cone named Nafanua. Contour interval is 20 m. Courtesy of H. Staudigel and S. Hart. Seismic monitoring during April-June 2000 showed substantial seismicity, ~ 4 earthquakes per day with hypocenters beneath Nafanua (Konter and others, 2004; BGVN 26:06), which can now be interpreted as pre-eruption seismic activity. These observations are consistent with previous reports highlighting the volcanic and hydrothermal activity of Vailulu'u (Hart and others, 2000; Staudigel and others, 2004). The scientists suggested that continued volcanic activity could bring the summit region of Vailulu'u to a water depth of ~ 200 m. At that point, Nafanua would overtop the crater rim and further growth would require a build-up of the lower flanks, areas that rise from the 5,000-m-deep floor of the ocean. Staudigel and Hart teamed up in April 2005 on the Hawaiian Research Vessel Kilo Moana to study the Samoan hotspot thought to underlie Vailulu'u. They named their expedition ALIA after the ancient twin-hulled canoe that Samoan warriors used to explore the SW Pacific. The Kilo Moana left Pago Pago on 4 April 2005 to study active and extinct underwater volcanoes along the chain of Samoan islands. The expedition investigated previously uncharted seamounts and the submarine portions of some islands, scattered over almost 600 nautical miles, from its most recent and quite active Vailulu'u submarine volcano in the E to Combe Island in the W.
The Nafanua cone was first mapped by using the center beam of the research vessel KOK in several crossings of the W crater. An active hydrothermal system was apparent from evidence such as the murky water that limited visibility during two submersible dives, several microbial biomats covering pillow lavas that were centimeters thick, and a large number of diffuse vents. A dive on 30 March 2005 to examine Nafanua reported "that it must have grown in the last 4 years because CTD (conductivity-temperature-depth) crossings in 2001 still were consistent with the old crater morphology ... the basal portion of the cone displayed relatively large pillows, and higher up pillows look almost like very fluid pahoehoe that collapsed and/or transitioned into aa flows. Nafanua . . . grew very fast with abundant breccia material from collapsing and draining pillows, in particular in the summit region." On 1 April, another dive along the outer flanks of Vailulu'u found that during the up-slope transit, observers saw a few additional areas of active venting and many sites where there had been venting in the past. Large and perfectly formed pillow lavas were present in most sites, with a few areas being dominated by broken talus fragments and some having completely black glassy pillows with no oxidation, apparent evidence for relatively recent formation. The topography was extremely rough, the slope being punctuated with numerous fissure systems and edifices of pillow lava. A primary plan for the ALIA expedition was to study the water in and around the seamount for several days using a CTD probe. To sample the inside of the volcano for a full tidal cycle, the scientists varied the depth of the CTD between 40 and 930 m (almost to the crater floor), collecting various data, including visibility. At Vailulu'u, the particulates given off by hydrothermal venting are flushed out of its caldera during each tidal cycle into the surrounding water. In 2005, a dense layer of particulates was found in the water within the crater, but the water was clear outside the crater rim. This contrasts with observations seen from the cruise in 2000, when there was a dense ring of particulates around the whole volcano. It appears that in 2005 the particulates were rising above the crater and then later sinking, instead of forming the widespread ring observed in 2000. In addition, the expedition crew conducted dredging of the new summit of Nafanua. Staudigel and Hart noted that the rocks from the first dredge haul were quite newly formed, containing pristine olivine-phyric volcanic rocks. Abundant large vesicles in the rocks from Nafanua suggest a volatile-rich magma capable of submarine lava fountaining and explosive outgassing in shallower water. Dredging from a second site, outside of Vailulu'u, recovered rocks that were both much older and far less fragile. References. Hart, S.R., Staudigel, H., Koppers, A.A.P., Blusztajn, J., Baker, E.T., Workman, R., Jackson, M., Hauri, E., Kurz, M., Sims, K., Fornari, D., Saal, A., and Lyons, S., 2000, Vailulu'u undersea volcano: The new Samoa: Geochemistry, Geophysics, Geosystems (G3), American Geophysical Union, v. 1, no. 12, doi: 10.1029/2000GC000108. Konter, J.G., Staudigel, H., Hart, S.R., and Shearer, P.M., 2004, Seafloor seismic monitoring of an active submarine volcano: Local seismicity at Vailulu'u Seamount, Samoa: Geochemistry, Geophysics, Geosystems (G3), American Geophysical Union, v. 5, no. 6, QO6007, doi: 10.1029/2004GC000702. Lippsett, L., 2002, Voyage to Vailulu'u: Searching for Underwater Volcanoes. Woods Hole Oceanographic Institution, Fathom online magazine (URL: http://www.fathom.com/feature/122477/). Staudigel, H., Hart, S.R., Koppers, A., Constable, C., Workman, R., Kurz, M., and Baker, E.T., 2004, Hydrothermal venting at Vailulu'u Seamount: The smoking end of the Samoan chain: Geochemistry, Geophysics, Geosystems (G3), American Geophysical Union, v. 5, no. 2, QO2003, doi: 10.1029/2003GC000626. Information Contacts: Hubert Staudigel, Institute of Geophysics and Planetary Physics, Scripps Institution of Oceanography, Univ. of California, San Diego, La Jolla, CA 92093-0225, USA (URL: https://earthref.org/whoswho/ER/hstaudigel/, https://igpp.ucsd.edu/); Stanley R. Hart, Woods Holes Oceanographic Institute, Geology and Geophysics Dept., Woods Hole, MA 02543, USA; ALIA Expedition, Samoan Seamounts, R/V Kilo Moana (KM0506), supported by the San Diego Supercomputer Center and the Scripps Institution of Oceanography (URL: https://earthref.org/ERESE/projects/ALIA/). The Global Volcanism Program has no Weekly Reports available for Vailulu'u. The RSP stations on Tahiti, Rangiroa, Tubuai, and Rikitea registered acoustic T-waves beginning at 1700 on 8 January from a seismic swarm that, estimated from T-wave arrivals, was centered in the vicinity of the E Samoa Islands. Small events continued until 1600 on 9 January, but became stronger after 1645. Between 1645 on 9 January and 13 January, 54 small events and 28 stronger events were detected. The largest event occurred at 1407 on 10 January and was detected at all the RSP stations. Signals continued through January at a rate of two or more each day. During 8-31 January there were 91 small events and 40 stronger events. The world-wide seismic network detected 12 events (M 4.2-4.8) in this area during 9-20 January (table 1 and figure 1). T-wave arrival times in Tahiti (data available through 13 January) showed a consistent 23-24 minute delay for these events. Table 1. Earthquakes detected and located by the World-Wide Seismic Network, 9-20 January 1995, near Ta'u Island. T-wave arrival times in Tahiti are consistently 23-24 minutes later than the event UTC time. Data courtesy of the USGS National Earthquake Information Center and LDG Tahiti. Figure 1. Map showing locations of nine earthquakes NE of Ta'u Island, Samoa, during January 1995. Hypocenters are labeled with the date (0112 = 12 January) of the event. Two located events not shown plot farther NW, and one to the E of the map area (see table 1). Index map modified from Stice and McCoy (1968). RSP seismologists believe that the swarm was volcanic because the signals are similar to the classic Monowai and Raoul T-waves: short-duration and impulsive. Submarine eruptions at Monowai Seamount were detected by T-wave signals in 1986, 1988, and 1990-91 (SEAN 13:09, BGVN 15:09, and BGVN 16:03). The stronger events in this swarm were the same amplitude as normal Monowai or Raoul T-wave signals. T-waves produced by earthquakes have much longer durations and are not impulsive. Also, this area is not seismically active; one small event was recorded in 1969 and another in 1976 (M 5.0). The Manu'a Islands (Ta'u, Ofu, and Olosega) were built by volcanic activity along the crest of the easternmost portion of the Samoa Ridge (Stice and McCoy, 1968). This earthquake swarm was centered ~50 km NE of Ta'u Island, the emergent portion of the large Lata shield volcano; numerous Holocene post-caldera cones occur at the summit and on the flanks of this volcano. Ofu and Olosega islands, NW of Ta'u, are formed by two eroded coalescing shield volcanoes. A submarine eruption along the ridge between Olosega and Ta'u islands, ~3 km SE of the tip of Olosega Island, was reported from 12 September to the middle of November 1866. A possible submarine eruption E of Ta'u was detected by SOFAR in July 1973. Reference. Stice, G.D., and McCoy, F.W., Jr., 1968, The geology of the Manu'a Islands, Samoa: Pacific Science, v. 22, p. 427-457. Information Contacts: Francois Schindele, Laboratoire de Geophysique (LDG), B.P. 640, Papeete, Tahiti, Polynesie, France; National Earthquake Information Center (NEIC), U.S. Geological Survey. The RSP stations in Tahiti registered acoustic T-waves (tertiary waves traveling through the ocean) beginning on 8 January. This seismic swarm ended after 9 small and 5 stronger events in early February. The total number of recorded events during this swarm was 100 small and 45 larger events. Twelve of the larger events in January (M 4.2-4.8), detected and located by the world-wide seismic network, showed that the swarm was spread ~130 km along a NW-SE trend,~50 km NE of Ta'u Island (see figure 1) in the E Samoa Islands. Information Contacts: F. Schindele, LDG, Tahiti; NEIC. Recent work by Hart and others (2000) has described this volcano and identified it as the source of acoustic signals noted in July 1973 and an earthquake swarm during January 1995 (BGVN 20:01 and 20:02). The following is from Hart and others (2000) except where noted. Vailulu'u Seamount is located 45 km east of Ta'u island, the easternmost island of the Samoan chain, and defines the leading edge of the Samoan swell (figure 2). 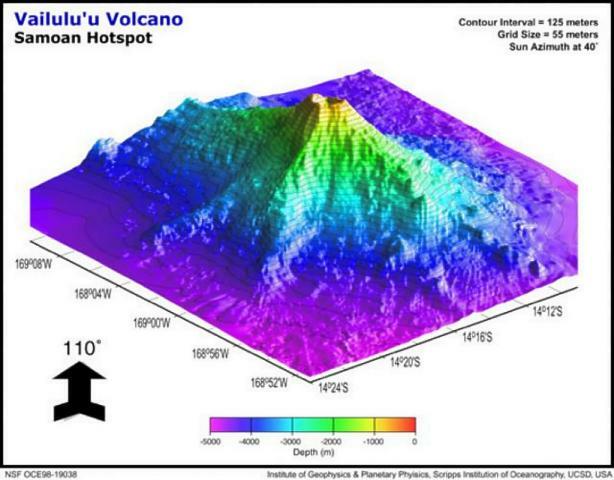 Mapped in March 1999 with SeaBeam aboard the RV Melville during AVON cruises 2 and 3 (figures 2 and 3), Vailulu'u rises from an ocean depth of 4,800 m to its crater rim within 590 m of the sea surface, with a total volume of ~1,050 km3. The summit includes a 400-m-deep, 2-km-wide crater (figure 4). These cruises were motivated by the 1973 and 1995 acoustic and seismic events in this region, and were a direct attempt to find the current location of the Samoan hotspot. Figure 2. Bathymetry of Vailulu'u and nearby Ta'u Island, based on a SeaBeam bathymetric survey performed during R/V Melville's AVON 2 and 3 cruises, augmented with satellite-derived bathymetry from Smith and Sandwell (1996). The inset shows the general location of Vailulu'u with respect to the Samoan Archipelago; two other newly mapped and dredged seamounts (Malumalu and Muli, AVON 3 cruise) are shown as well. Scale: 10' = 18 km. From Hart and others (2000). Figure 3. Perspective view of Vailulu'u seamount looking NW, displaying three major rifts toward the E, SE, and W. The lower slopes of Vailulu'u and Ta'u merge along the western ridge, with a saddle at 3,200 m. Vailulu'u is ~ 35 km in diameter at its base. Scale: 10' = 18 km. From Hart and others (2000). Figure 4. SeaBeam bathymetry map of the summit crater of Vailulu'u, showing the crater rim with three peaks and three breaches, the location of CTDO (conductivity, temperature, depth, optical) casts 1 and 4, and the tow-yo track circumnavigated around the summit. Dotted azimuth lines are given every 30° along the track. Scale: 1' = 1.8 km. From Hart and others (2000). The overall shape of Vailulu'u is dominated by two rift zones extending E and W from the summit, defining a lineament parallel to the Samoan hotspot track. A third, slightly less well-developed rift extends SE from the summit, and several minor ridges extend out from the lower slopes, making an overall asymmetric, star-like pattern. Rift zones and ridges in the southern sector are more strongly developed than those on the N flank, giving Vailulu'u a stunning similarity to a juvenile Ta'u island (figure 2). The three major rift zones define three high points of the crater rim. The crater and rim are oval-shaped (figure 3), with two well-developed pit craters defining the northern two-thirds of the crater and two minor depressions on a bench in the southern third of the crater. Several historical events suggest volcanic activity. There was a series of acoustically detected explosions on 10 July 1973 (Johnson, 1984), and during 9-29 January 1995 the global seismic network recorded a strong (M 4.2-4.9) earthquake swarm in the vicinity (BGVN 20:01 and 20:02). While most of the 1995 earthquakes were formally located NW of the volcano, their uncertainty ellipses include Vailulu'u; a SeaBeam survey within the apparent earthquake area did not reveal any volcano-tectonic features. Dredges, especially those from the summit area, are dominated by fresh volcanic rock, with pristine volcanic glass, many original glassy surfaces, unaltered olivine phenocrysts, and a virtual lack of vesicle fillings. Extremely "bright" SeaBeam sidescan returns suggest that fresh volcanic rocks occur ubiquitously throughout the slopes of Vailulu'u and that sediment cover is largely absent. A detailed nephelometry survey of the water column shows clear evidence for hydrothermal plume activity in the summit crater. The water inside the crater is very turbid, and a halo of "smog" several hundred meters thick encircles and extends away from the summit for at least 7 km (see Hart and others, 2000, for details). During the DeepFreeze 2000 cruise in March 2000, aboard the U.S. Coast Guard Icebreaker Polar Star, conductivity temperature depth optical (CTDO)/Niskin stations were occupied at three places within the summit crater and two outside the crater; in addition, the summit area was circumnavigated in tow-yo mode along the ~1,000-m contour (figure 4). Particulate distribution in the water column was studied using a light backscattering sensor (LBSS) attached to a CTD/Niskin water sampling rosette. At 600-m depth in the crater turbidity increased sharply and continued to do so in a stepwise fashion to the bottom of the crater at 996 m. Turbidity near the bottom was greater than that associated with active venting and plume formation on ridge crests. At station 1, outside the crater, the LBSS "smog" layer starts at about the same depth (610 m) but returns to background values at 850 m. This depth interval is comparable to the elevation range of the crater rim, which has peaks at 590 m and a deepest breach at ~780 m (figure 4). At station 5, 7.5 km E of the crater rim, a small turbidity anomaly was observed at a depth of 600-720 m.
During a complete 360° circumnavigation of the summit crater, the plume was mapped from 500 to 900 m depth in tow-yo mode (figure 4). Overall, the hydrothermal plume was confined to a narrow depth interval bracketed between the breaches and summits of the crater wall. Its upper, neutral buoyancy, level corresponds closely with the heights of the peaks on the crater rim. Virtually no particulate matter appears to be ejected from the crater to heights above the peaks on the crater rim nor does any settle below the breach depth during its dispersion laterally away from the summit. Particulates are being generated within the crater and are subsequently carried away by ocean currents. Vailulu'u is clearly a young and active submarine volcano. Its activity is reflected in acoustic/seismic events in 1973 and 1995, the lack of any sediment cover, fresh basalt and pristine glass in dredges from all levels, and radiometric ages ranging from 5 to 50 years. The summit is marked by a sharply delineated crater over 400 m deep, filled with highly turbid water. This smog layer extends out as a halo for many kilometers in all directions, in a narrow depth interval defined by the range in depths of the rim of the summit crater. During another cruise to Vailulu'u in April 2001, on the USCG Icebreaker Polar Sea, Hart and colleagues retrieved five hydrophones and temperature loggers that had been deployed the year before. A lot of minor seismic activity was still occurring, but detailed analyses have not been completed. The crater was still full of "smog," indicating that the crater remains hydrothermally active. Previous work by Rockne Johnson. This seamount was discovered on 18 October 1975 by Rockne Johnson (Johnson, 1984) using an echosounder and a proton magnetometer aboard the 19-m ketch Kawamee while searching for the source of explosions detected on 10 July 1973. Those explosions, 26 within a 30-minute period, were identified in records from SOFAR (sound-fixing and ranging) stations at Wake and Midway Islands. The signals were calculated to have been from a source along a line that fell 15 km E of Ta'u Island, and were distinct from signals recorded a few hours later caused by a submarine eruption south of Curacao Reef 500 km W at the north end of the Tonga Ridge (CSLP Cards 1679, 1685, and 1694). Depths near 600 m were found around the summit, and a large magnetic anomaly was centered 4 km NW of the summit. Johnson (1984) believed that the seamount, which he named "Rockne Volcano," was the most likely source for the July 1973 activity, but noted that there was some doubt because of its distance from the line of position calculated from the acoustic data. Selection of a volcano name. As reported by the Samoa News, the Samoa Department of Education's Science Department held a "Name that Volcano" contest in the high schools to come up with a permanent name for this volcano. Previously the volcano had been catalogued as "Unnamed" (Simkin and Siebert, 1994), and named "Rockne" (Johnson, 1984) and "Fa'afafine" (Hart and others, 1999). Woods Hole Oceanographic Institution scientist Stan Hart urged that the name endorsed by American Samoa be adopted by the scientific community. The winning entry, announced on 8 May 2000, came from Taulealo Vaofusi, a sophomore at Samoana High School. "Because of the location of the volcano being very close to the Manu'a Islands village of Ta'u," Vaofusi explained to the Samoa News, "I would like to rename that volcano 'Vailulu'u Volcano.' According to legend, Vailulu'u was the sacred sprinkling of gentle rain that fell just before the gatherings of the great King Tuimanu'a. The Manu'a group is also call the sacred islands or the Motu Sa, and the name 'Vailulu'u' is given to the fountain owned by King Tuimanu'a," said Vaofusi in his entry form. References. Hart, S.R., Staudigel, H., Koppers, A.A.P, Blusztajn, J., Baker, E.T., Workman, R., Jackson, M., Hauri, E., Kurz, M., Sims, K., Fornari, D., Saal., A., and Lyons, S., 2000, Vailulu'u undersea volcano: The New Samoa: Geochemistry, Geophysics, Geosystems (G3), American Geophysical Union, v. 1, December 8, 2000. Hart, S.R., Staudigel, H., Kurz, M.D., Blusztajn, J., Workman, R., Saal, A., Koppers, A., Hauri, E.H., and Lyons, S., 1999, Fa'afafine volcano: The active Samoan hotspot: EOS Transactions, American Geophysical Union, v. 80, 1999 Fall Meeting Supplement, p. F1102. Johnson, R.H., 1984, Exploration of three submarine volcanos in the South Pacific: National Geographic Society Research Reports, National Geographic Society, v. 16, p. 405-420. Smith, W.H.F., and Sandwell, D., 1996, Predicted bathymetry, new global seafloor topography from satellite altimetry: EOS Transactions, American Geophysical Union, v. 77, no. 46, p. 315. Stice, G.D., and McCoy, F.W., Jr., 1968, The geology of the Manu'a Islands, Samoa: Pacific Science, v. 22, p. 427-457. Information Contacts: Stanley R. Hart, Woods Hole Oceanographic Institution, Woods Hole, MA 02543 USA (URL: http://www.whoi.edu/); Samoa News, P.O. Box 909, Pago Pago, AS 96799 (URL: http://www.samoanews.com/). Vailulu'u, a massive basaltic seamount not discovered until 1975, rises 4,200 m from the sea floor to a depth of 590 m about one-third of the way between Ta'u and Rose islands at the E end of the American Samoas. It is considered to mark the current location of the Samoan hotspot. The summit contains a 2-km-wide, 400-m-deep oval-shaped caldera. Two principal rift zones extend E and W from the summit, parallel to the trend of the hotspot. A third less prominent rift extends SE of the summit. The rift zones and escarpments produced by mass wasting phenomena give the seamount a star-shaped pattern. On 10 July 1973, explosions were recorded by SOFAR (hydrophone records of underwater acoustic signals). An earthquake swarm in 1995 may have been related to an eruption. Turbid water above the summit shows evidence of ongoing hydrothermal plume activity. There is no Deformation History data available for Vailulu'u. There is no Emissions History data available for Vailulu'u. This perspective view of Vailulu'u seamount looks NW, displaying three major rifts toward the east, SE, and west. The lower slopes of Vailulu'u and Ta'u merge along the western ridge, with a saddle at 3200 m. Vailulu'u is ~ 35 km in diameter at its base. An earthquake swarm in 1995 may have been related to an eruption from this massive volcanic seamount, which was not discovered until 1975. It rises 4200 m from the sea floor to a depth of 590 m about one-third of the way between Ta'u and Rose islands at the eastern end of the American Samoas. Image by Hart and others (Global Volcanism Network Bulletin, 2001). Pillow lavas on the western rift of Vailulu'u volcano are colonized with exotic marine life, photographed during a NOAA Ocean Explorer expedition in 2005. Two principal rift zones extend east and west from the summit of the submarine volcano, parallel to the trend of the Samoan hotspot. 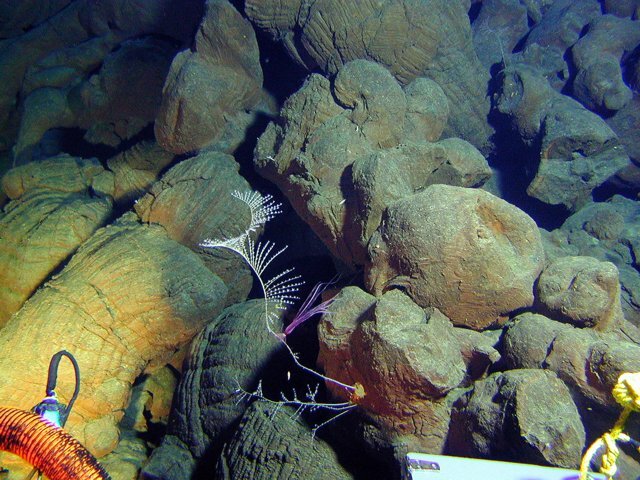 Not discovered until 1975, this massive seamount rises 4200 m from the sea floor to a depth of 590 m and displays evidence of hydrothermal venting. Image courtesy of Vailulu'u 2005 Exploration (NOAA Ocean Explorer). The Global Volcanism Program has no maps available for Vailulu'u. There are no samples for Vailulu'u in the Smithsonian's NMNH Department of Mineral Sciences Rock and Ore collection. Large Eruptions of Vailulu'u Information about large Quaternary eruptions (VEI >= 4) is cataloged in the Large Magnitude Explosive Volcanic Eruptions (LaMEVE) database of the Volcano Global Risk Identification and Analysis Project (VOGRIPA).